a woman might be capable of. Because I had such a fondness for paper dolls while growing up, I decided to use that format to detail the lives of these inspiring women. 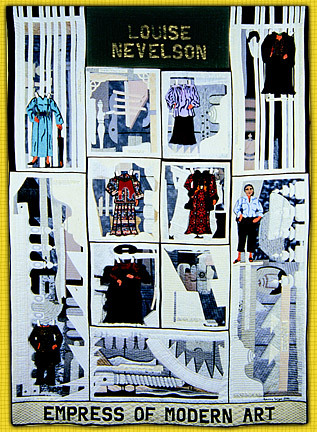 Each garment on the quilts is a miniature quilt itself, attached to the main quilt with Velcro so on can actually move the dresses on to the doll and “play paper dolls”. I have lived with each of these women in turn while working on their tributes and I have come to think of them as members of my own family. 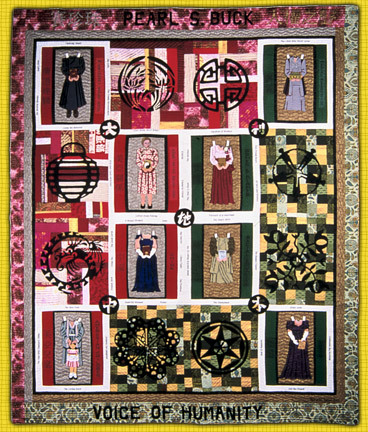 They are all my grandmothers, teaching me, and others who view the exhibit of these quilts, about the true breadth and scope of “women’s work”. That is a term that is almost pejorative, referring to the menial work of keeping a house and child rearing or to most type's of needle- work. It is true that “woman’s work” applies to these most important areas of our lives, but for these women and for most women today, these narrow roles are not enough. 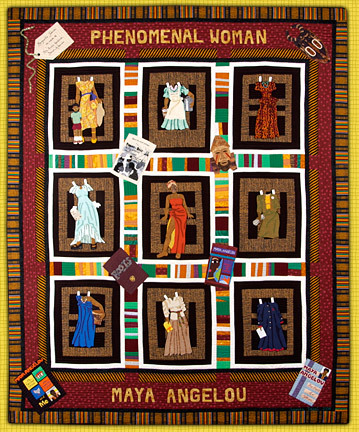 Personally, it is not enough to have any needle art thought of in the context of “women’s work” and that is why this tribute is stitched. I love that the lowly needle and thread can surpass their traditional roles to produce art that vies with that of brush and canvas. "Just don't give up trying to do what you really want to do. in her field who either promoted her career or celebrated it. Jean is the second woman I have chosen to represent in my series about inspiring women. Because the paper doll was such a favorite toy for me as a girl, I delight in making quilts that work just like paper dolls. I also find it interesting to tell someone’s story through the garments they wore for special moments in their lives. I chose to portray Jean as a child because I feel her whole life was formed by what she learned as a child in the mountains of Eastern Kentucky. 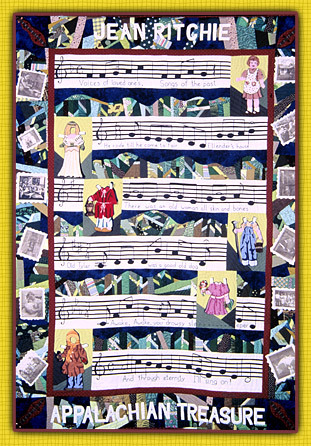 Some of the words of Jean’s favorite songs are written on the quilt with garments that suggest something that those songs hold dear memories of. For instance, when she sang the Ballad of Fair Ellender as a child, she always thought of herself as Fair Ellender with long blond hair and flowing white gowns. Other songs evoke memories of being scared by her older brothers and sisters with songs and stories in the night or working in the field along side her father. Jean provided photographs of herself at various points in her life and these have been added to the quilt by way of Xerox transfers. The mountains are done in an old mountain traditional quilt making technique called string quilting. The only thing Jean asked me to put on the quilt was a dulcimer so there is one in each corner. 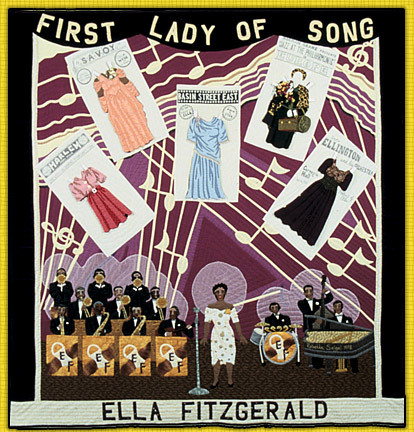 I chose Babe as the subject for my third paper doll quilt because I have always admired her since reading a biography of her as a child. She was a girl who didn’t let that fluke of nature hold her back in the world of athletics which was dominated by men during her time. She excelled at every sport she tried and was reported to have had a perfect body for athletics. This still life of some of her trophies on a table looking out onto her beloved golf course represents many of the sports she excelled in and the prestigious awards she received for her efforts. 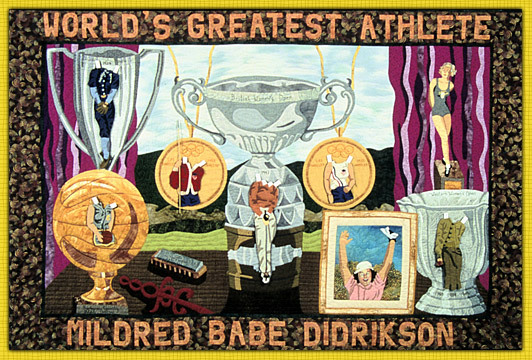 These include her two Olympic medals for javelin and hurdles and the trophy for being the first American woman to win the British Women’s Open Golf Tournament at the center of the quilt. The table also holds her harmonica, as she was very accomplished with that instrument and the symbol of the Cancer Society. When she was diagnosed with cancer she fought as hard as she could to overcome the disease and she also gave of her time and talent to help the Cancer Society raise money for research. Babe’s portrait on the table attempts to capture her spirit for life and is accomplished with machine embroidery and hand appliqué. 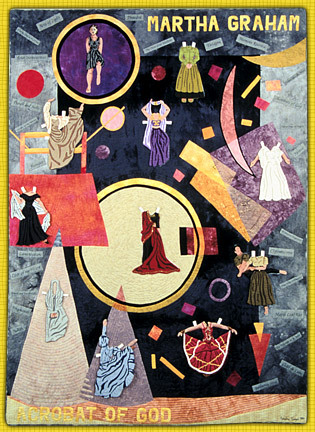 Martha Graham is the subject of my fourth paper doll quilt because of her pioneering efforts in the world of dance. She literally invented a new form of dance. She and her costumes are superimposed on a painting in the style of Wassily Kandinsky who was a pioneer of the abstract expressionist movement in visual art. It is reported that when Martha saw Kandinsky’s paintings for the first time she felt an instant kinship because she felt he was trying to do with the visual arts what she was trying to do with movement. All of the costumes are researched and depict those she created for some of her most famous dances. The beautiful names of many of the dances she set are in the border of this piece. Many of the fabrics in the background of this piece are hand dyed to recreate the feeling of a painting. Eleanor Roosevelt is one of my favorite ladies of the Twentieth Century and therefore worthy of becoming the fifth woman in my paper doll series. Since nearly all of her life was lived in the newspapers, I chose to use newspaper imagery to tell her story. The mastheads and headlines are photocopy transfers. 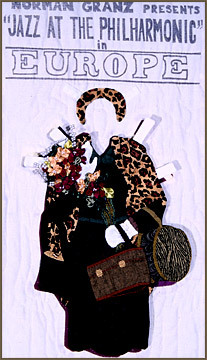 The newsprint fabric was silk screened for this piece by Patty Hawkins of Lyons, CO. Eleanor’s costumes reflect the style of the day during her life and some of the more important events and roles she played in her life. 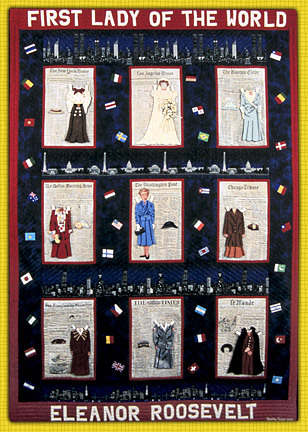 The flags of the world are added for interest and to suggest the role she played in world politics when she became the only woman delegate to the newly formed United Nations. She is the first character for whom I have created hats since she was hardly ever seen without one. 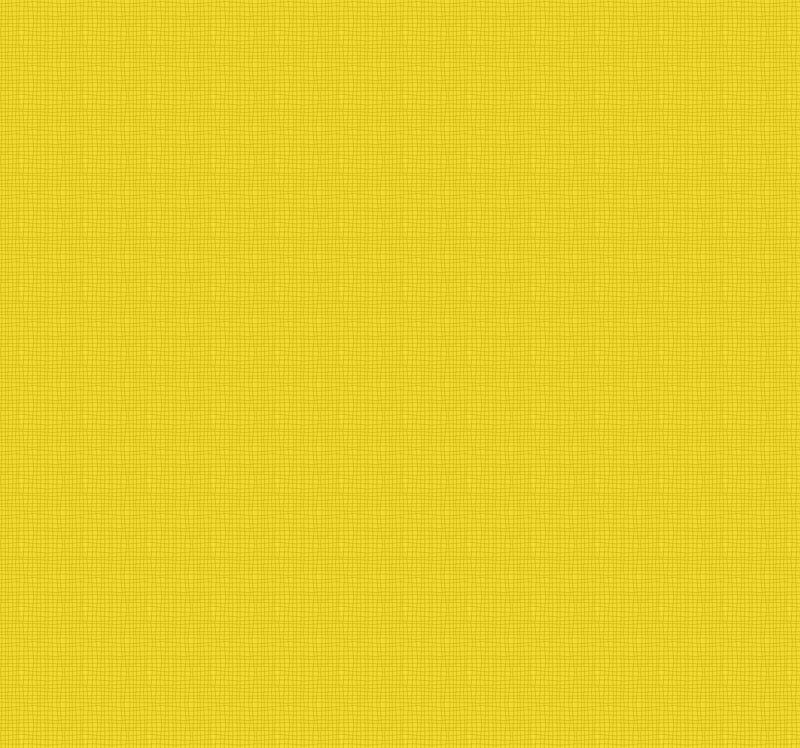 "How I wish people could retain the indefinable urge for self expression that seems to be a child's inheritance that so many of us shed for the material things in life." 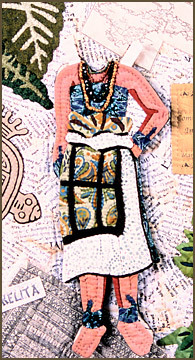 Louise is the 6th woman in my paper doll series. She is depicted in and among the sections of her sculpture, Dawn’s Wedding Chapel II, created from 1959-1963. I admire Louise’s spirit and commitment to a life lived making art. Some of my favorite quotes describing her life philosophy are included among the sections of her sculpture. 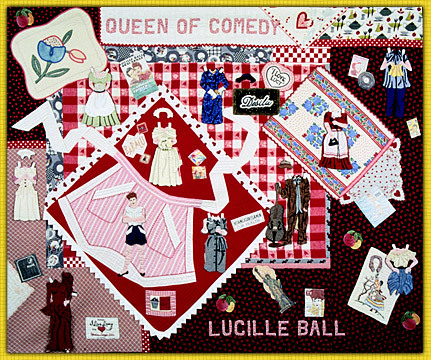 This quilt relies heavily on the techniques of appliqué and reverse appliqué and is executed in a monochromatic palette just as Louise’s sculptures are. It was hand quilted by Carmen Prewitt of New Columbus, KY.
and I hope my membership never expires. The eighth quilt in my paper doll series honors Rachel Carson for her brave pioneering stance on the protection of our environment. 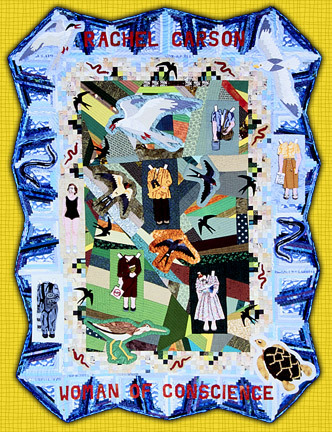 The format of the quilt is meant to represent the title of her second published book, The Sea Around Us. Rachel loved bird watching and beach combing all her life and these activities are reflected in 2 of the outfits on the quilt. Because she wrote so extensively about the sea at a time when we knew very little about it, she felt it important to do some deep sea diving. She only went down once as it was a very frightening experience for her in the heavy diving gear and aqua lungs of the day. Rachel is best remembered for her book, Silent Spring, in which her research on the devastation to wild life and the food chain perpetrated by the agricultural use of DDT heralded the beginning of the environmental movement. I chose Barbara Jordan as the ninth woman to honor in my paper doll series because of her courage, perseverance and eloquence. She chose a career first in the law because she saw that as a way of making a difference with her life in her community. This path led her in turn to chose politics as a way to address civil rights from the inside as opposed to demonstrating for change from the outside. Her voice and eloquence were legendary and she was able to effect change both in Texas and in the United States house of Representatives. 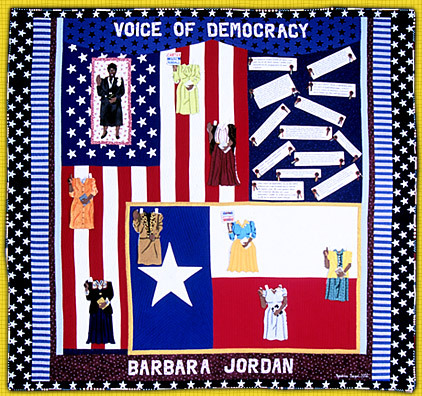 Both the flags of Texas and the United States form the biggest part of the background for her quilt because she loved both with all her heart and believed that justice was possible under the ideals of the Constitution for everyone. Her outfits refer to the offices she held as well as to highlights in her life made possible by those offices such as being a member of the House Judiciary Committee during the Watergate Investigation, being the Keynote Speaker for the 1976 Democratic Convention and campaigning for her favorite Democrats. 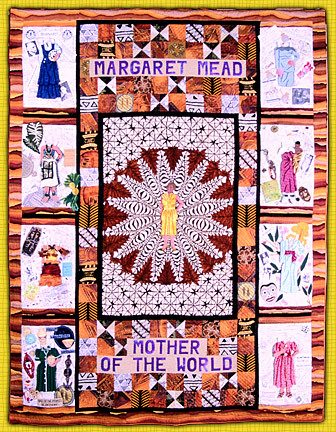 Some of her beautiful words and ideas are placed in the upper right hand corner of the quilt along with a few descriptions of her grace and power from others who knew her well. or to the job that she had in her long and interesting career. Lucy is honored in this series for her excellent craftsmanship as a potter from the Acoma Pueblo and her life lived within a unique tradition. Like Jean Ritchie, she built her life around the traditions of her family and people. Yet despite this devotion to tradition, Lucy managed to have a personal vision about her pottery providing her a personal means of expression, not simply copying the patterns of the past, but tweaking them and adding her own design sense to the work. Lucy studied the ancient shards she found from time to time around the pueblo and even ground them up to use for grog in her pots; a unique way of keeping the tradition within her work. She always fired her pots with dung in the same manner as her ancestors and taught her children to do the same despite other Pueblo potters who have taken to firing their works in electric kilns. 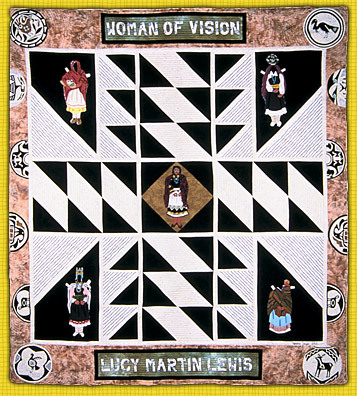 Lucy led a far more “normal” life than many of the other women portrayed in this group of quilts, but she graced her life with art, expression and tradition. 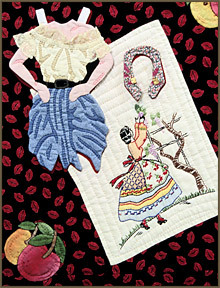 The pattern forming the body of this quilt is one that Lucy used often on her pots. The colors, black, white and tan, are the only colors Lucy used in her pottery. Images of her designs and those of her ancestral people, the Anastasi. are appliquéd around the border. Her costumes reflect the everyday tasks and celebrations of her life. She is shown carrying water, carrying a baby, selling pots to tourists and dressed in her dancing costume and “Sunday Best”. Lucy loved dressing up and donning her beautiful jewelry. I chose Pearl to be my twelfth honoree initially because I wanted someone literary for the group, but after doing the research I came to admire Pearl far less for her writing and much more for her sense of social responsibility. Pearl’s quilt has two different halves just like her life. She was raised in China, but lived all of her adult life in America. She took it upon herself to explain Asian culture to Americans who at the time knew very little about the ways of China. Her mother had impressed upon her the greatness of the promise that America represented to the rest of the world. When Pearl eventually settled here and found that promise lacking in the areas of racial equality, women’s rights, treatment of the mentally retarded and acceptance of the children born of Asian women and American servicemen, she used her skills as a writer to bring light to these issues in the hopes of changing attitudes. The red half of the quilt represents China and the green represents America. 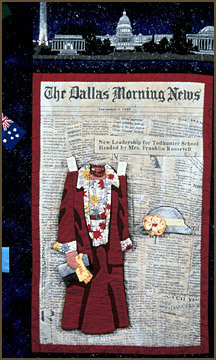 The black appliqués in each half reflect the folk art indigenous to each culture. Each one of Pearl’s dress blocks represents an issue of importance to her in her life. The issue is written in both English and Chinese. The white strips surrounding each block list the books that she wrote with that issue as a subject. I called on the language skills of the owners of my favorite Chinese restaurant for the Chinese translations. to live with her grandmother.